A brick mason is responsible for constructing buildings and other structures from brick. This trade is learned through a combination of education and on-the-job training that can take anywhere from four to five years to fully complete. In building new structures, brick masons will be responsible for preparing the mortar that is used to hold bricks together. They may sometimes need to cut bricks to size in order to ensure they fit properly around door and window frames. Most of their work is performed outdoors, and can involve climbing ladders or scaffolding while carrying heavy loads of brick. Many vocational and technical colleges offer certificate programs in brick masonry. One of these programs typically takes around one year to complete, and will involve honing basic math skills and learning to read blueprints. Students may also be asked to complete a basic project such as a brick sidewalk or raised garden bed before graduation as well. After receiving a technical certificate, students can then apply for an apprenticeship program with a local bricklaying company. The International Union of Bricklayers & Allied Craftworkers has union halls located around the country, and representatives of this union help to match qualified candidates up with available openings. 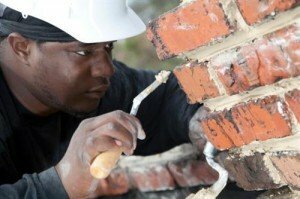 Those who have already obtained a technical certificate in brick masonry are more likely to be chosen for one of these openings than applicants that have no formal training whatsoever. The Bureau of Labor Statistics reports that apprenticeship programs typically last between three to four years. During that time, workers must complete at least 2,000 hours of on-the-job training under the supervision of an experienced brick mason. They must also complete 144 hours of technical instruction that is given in a classroom environment. Candidates are paid for on-the-job training, and may or may not be paid for classroom instruction. After successfully completing an apprenticeship program, individuals are considered to be journeymen, and are no longer required to be directly supervised. Brick masons are largely employed with construction crews, where they help to build new houses, schools and commercial buildings. They can sometimes be employed by landscaping contractors, where they will construct retaining walls, patios, outdoor fireplaces or walkways for homeowners. Some bricklayers elect to work as independent contractors, filling in with different crews whenever they have an extremely heavy workload or taking on small repair projects for residential clients. Block and stone masons perform work that is similar in nature to that of a brick mason. Like brick masons, they also create structures from either block or natural stone by using mortar to hold them together. While these occupations are similar, it nonetheless requires a different set of skills in order to be proficient at each one. Those who have mastered bricklaying often elect to diversify their skill set and become adept at stone and block masonry as well. This allows for even greater employment opportunities for those who are successful at doing so. Since people will always desire homes made of brick, the demand for brick masons is likely to continue in the coming years. Perfecting this craft takes a good bit of time to accomplish, and this fact coupled with a low turnover rate in the industry means a great deal of job security as well.